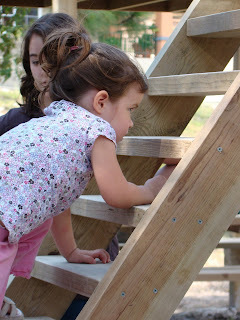 Life Lessons Learned from Building a Playground! 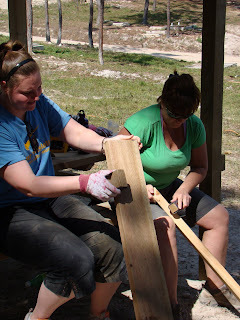 These pics show the team hard at work on the playground that they set out to finish. Each member had a specific job and it was wonderful seeing everyone working together. As the playground evolved everyone became more and more excited to reach the finished goal. It became easier each day to visualize the children playing on it for years to come! 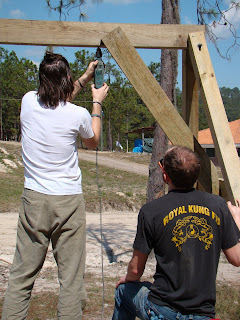 HOURS AND HOURS AND HOURS were dedicated to building, measuring, hammering, sanding, cleaning up, and more! It was very exciting when Chapel Holliday was the first child to climb the ladder!! As we finished all that we could in the time that we had: we all took the time to pose for a group shot on the bridge and under it.........Seeing Chapel climb each step reminded us once again God's plan was for us to grow closer to Him and that the playground was simply a step in that direction! I am thankful that Heal Ministries was able to be a part of such an important week in the life of Providence World Ministries. Their family model for orphans is offered to everyone all around the globe. Perhaps the bridge that we sat on during our last hours in Siguadepeque will forever remind us to bridge the gap between what the world thinks is right for orphans versus what God intended in James 1:27.